Explore the Atlantic or the Intracoastal Waterway. Bike or walk along A1A. Hike the Everglades. Enjoy a workout or healthy fare at one of our four-star spas, or run February&apos;s beachfront marathon. Greater Fort Lauderdale is a panacea for healthy living - and anyone hoping to stay fit while enjoying a vacation getaway. Run the Fort Lauderdale A1A Marathon and Half-Marathon. Run along Las Olas Boulevard and the beachfront of State Road A1A in February. Learn more at A1AMarathon.com. The beach and downtown also have running clubs and frequent 5K and 10K events. Check SFRunningForum.com for a list of groups, runs and events. Walk or Hike Fort Lauderdale. The city&apos;s Commit 2B Fit program is held in city parks as a program developed to increase the community&apos;s health - and educate walkers about city parks and amenities. The city&apos;s also home to various walking clubs. Nature and photography lovers can hike the Everglades or our natural parks. Bike Broward. Two-wheel it with Broward County&apos;s Bike Broward and new B-Cycle bike sharing program. Some bikes come equipped with onboard GPS to track mileage, calories burned and carbon offsets. Beachfront bike rental vendors also can be found along A1A. Inquire or register online. Explore Our Water Sports. 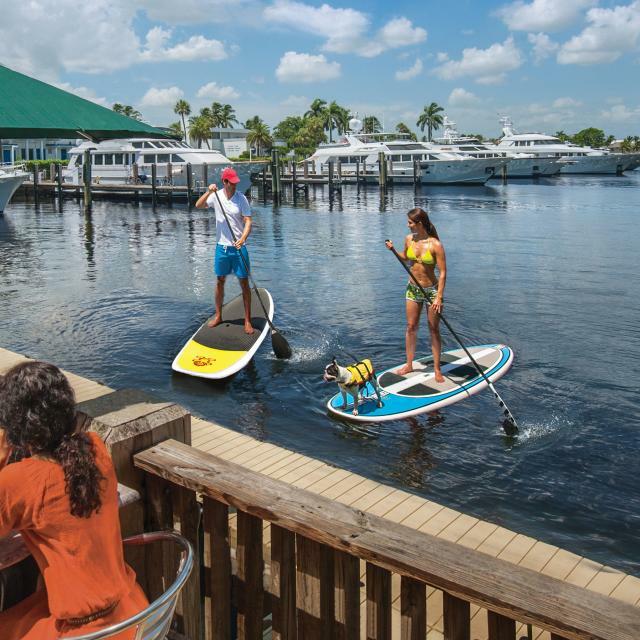 Distance swim, surf, skim board or paddle board along the Atlantic coast - or kayak or canoe the Atlantic, Intracoastal or Everglades. Most outfitters offer free lessons. For a change of pace, try yoga from atop a paddle board FortLauderdalesup.com. Tennis - or Golf - Anyone? Hit the links, play tennis, or enjoy the fitness center at an area four-star golf and tennis resort or world-class spa. Dozens of golf facilities - from championship to executive courses - dot the landscape. Near downtown Fort Lauderdale, the Jimmy Evert Tennis Center is one of the nation&apos;s finest public tennis facilities, where pros Chris Evert and Jennifer Capriati honed their games. Private lessons are available. Dine Healthy. Fort Lauderdale features fare to excite the palate - and watch the weight. Portion-appropriate selections encourage healthy eating, and lighter fare - like a tapas bar - help stimulate conversation. The city also supports the TodayIWill.com initiative to educate patrons about diet and exercise. Bring the Kids. Fitness for all ages can be found in Fort Lauderdale. From tennis and golf, to bicycling, water sports, clubs, classes and healthy dining options, many age-appropriate health and fitness options are available. Call the facility or outfitter first to ask about age restrictions. For an adventurous, ocean-oriented outing, try Funky Fish Ocean Camp. Available by the day or week, it&apos;s a "liquid playground" open to children of all ages. Click here for LauderKids. Use Your Gym Membership. Many national fitness clubs and gyms accept members at locations in other cities. Guests also can ask for or buy a temporary membership at an area club, or Zumba, strength/core training, yoga or Pilates studio. Fort Lauderdale hosts a variety of fitness, functional fitness, step and boot camps - some of which are held on the beachfront, putting a uniquely South Florida twist on your morning workout.